Surprise after surprise. The Great Wall of China is not the artificial structure most easily distinguishable from space. That “honor” goes to the greenhouses of Almeria, in southern Spain. But what is their living counterpart? 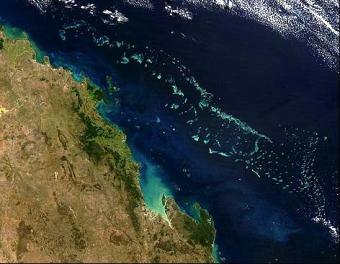 Some would say that Australia’s Great Barrier Reef is the largest living structure. But it seems this is not entirely true. Like so many other questions, this rather depends on how the question is asked and on the answer we are looking for. The Great Barrier Reef is an immense mass of coral colonies stretching over more than 2,500 kilometers to the north-east of Australia. It is sometimes said that it is the largest animal in existence (corals are animals, after all), or the largest living structure, at least. Whatever the actual case, the experts say it is one of the most complex and diverse systems in existence. It is also one of the most fragile. The accompanying photograph by the Terra satellite shows this unique structure from near-Earth orbit. Details of about the size of one kilometer can be seen, but in the original, high resolution, image we can see structures of up to 250 meters. Figure 1: The Great Barrier Reef, off the continental mass of Australia, as seen by the Terra satellite’s Multi-angle Imaging Spectroradiometer. Source: NASA/GSFC/LaRC/JPL, MISR Team. This marvel –a UNESCO world heritage site- has been classed as one of the seven natural wonders of the world by a leading international television channel. But it is in danger. About half of its coral has been lost since 1985, and it is under great pressure from various environmental factors, including man-made pressures: climate change, with resulting increases in sea temperatures and acidity levels; and the effects of mining and agriculture, depositing huge quantities of polluting material in nearby waters that are having a serious negative impact on the survival of this structure, which we can regard as a barometer for the health of our planet. The Australian government recently published a plan to create a more sustainable situation (“Reef 2050 Long-Term Sustainability Plan”). However, a recent report sent by the Australian Academy of Science to the Australian government argues that the actions set out in the plan are totally insufficient, even to maintain the reef in its current condition, which is less than ideal, and could be described as deplorable. However, despite its magnificence and scale, even in its current condition, this mass of coral reefs is not actually the largest living structure that can be distinguished from space. The actual winner is what appears to be one of the most desolate regions on our planet; one that is probably even visible from the Moon. Figure 2: Antarctic sea ice, the surface of which changes with the seasons. Source: National Snow and Ice Data Center. Yes, the Antarctic continent. More specifically, the Antarctic seas and the ecosystems beneath their seasonal ice. This sea ice covers a type of meadow home to an astounding quantity of krill (a type of crustacean similar to a shrimp) and an extraordinary biodiversity that we could say is like something from the past. Whales and other cetaceans also depend on krill, either directly or through animals that eat them. 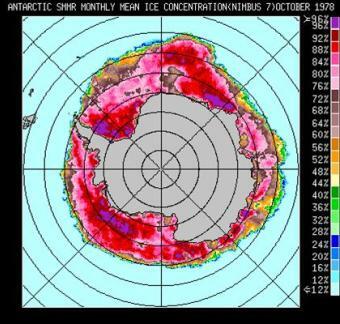 When we break up the Antarctic sea ice we find that its color is not uniform. The hidden, submerged, part shows brown and green tones: the Antarctic meadow, covering millions of square kilometers, although this is highly seasonal, varying between three million up to almost 20 million. However, this change favors its identification from a distance. Moreover, these effects -variations in the albedo or reflectivity of the planet– could be used to estimate whether biological activity could be detected across inter-stellar distances using sophisticated interferometer techniques, a curious light effect caused when it interacts with itself. Any similar phenomena could, therefore, provide the first evidence of life beyond our solar system. 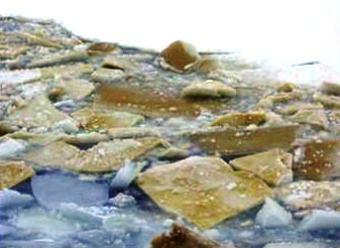 Figure 3: Sea ice broken up by a ship, showing the submerged part (courtesy of R. Scharek). There is a rich variety of life beneath the sea ice, and on the seabed enriched by material deposited on it. A huge quantity of fauna lives on this marine bed, in what we can say is one of the most diverse ecosystems with the greatest biomass. And it should be no surprise that this biological (and mineral) wealth has resulted in a race to control the resources of the white continent. These tens of millions of square kilometers are home to a surprising and complex living structure, which changes significantly with the seasons, with effects reverberating around the whole planet. And, as we said at the beginning, it can be distinguished from space. A vital ecosystem threatened, of course, by climate change and the actions of man. 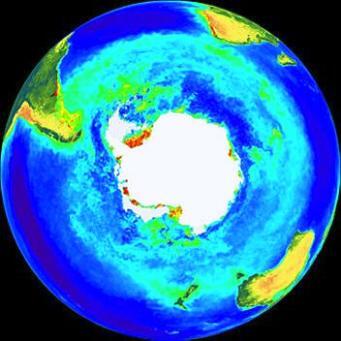 Figure 4: Distribution of chlorophyll (from phytoplankton: yellows and reds indicate higher concentrations) around the Antarctic, obtained by NASA’s Seaways satellite.